Have You Ever Put Yourself in a Time-Out? 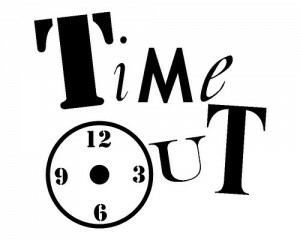 Time-outs are generally thought to be used with children, yet they can be very useful for adults too! The purpose of a time-out is to take a break from a situation, usually to calm down and then to be able to think about the situation. When an adult wants to take a time-out, it is respectful to let the other person or people, even your children, know that you are taking a time-out/a break to calm down and think, rather than walking away or storming off. Just like for children, adult time-outs should be short, about 10-15 minutes. Then check in with the other person. If you are not ready to resume the conversation then you might propose to table the topic until later that day or the next day, to give yourself time to get clear on what your position is and what you really want to say. This can be used when you need time to think about a punishment for a child, when you are feeling overwhelmed and can’t think clearly, when you feel too emotional to make a wise decision, or when a decision needs to be made and you are feeling pressured. A time-out can be taken in a quiet room, this includes the bathroom, or sitting or walking outside. It is best not to go for a drive when you are feeling emotional and may be unable to focus, although it would be okay to sit in your car to take a time-out. It’s good modeling for your children to see you use time-outs for yourself, as a good thing to regroup your thoughts and feelings, rather than as a punishment.